I noticed that for languages that are written from right to left, the unity interfaces stays the same. 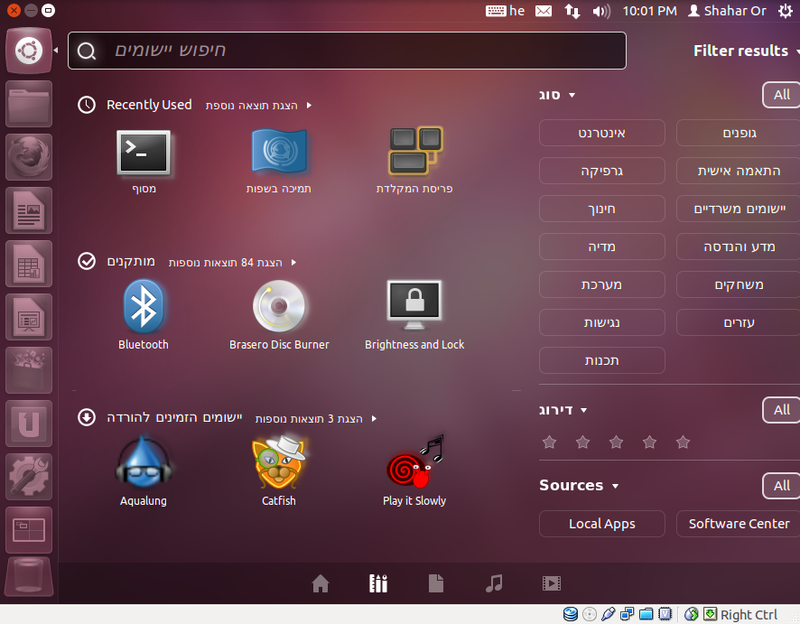 This is a little inconsistent with other GNOME apps: the left sidebar with the launchers should be on the right, and the top panel's items should be ordered from right to left. The fact that now the menubar is rendered by unity makes it even more bothering. The menus are rendered in reversed direction, and open to the right instead of to the left. The exception is only for Unity 2D for which the RTL support is ready. The code impact is fairly small and the user interface for non RTL languages is left entirely untouched. 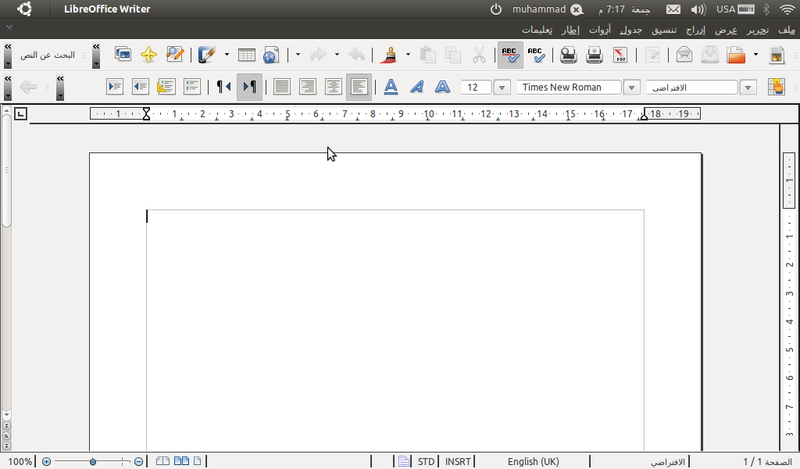 Attaching a screenshot demonstrating the problem. I was thinking some discussion is needed for the best solution to this bug. Specifically, how to arrange the top panel. While I would expect the top panel to be mirrored when the desktop is RTL, some applications might not be translated, and use an LTR menu. In this case I suppose that the application menu would need to be drawn from left to right. Perhaps the application title should also move to the left of the menu, but I don't know about the rest of the panel. I think it should remain RTL so that it won't confuse the users. What do you think? Is this even the right place to discuss this? This is an interesting policy issue; it's possible counter that it should be done by default by users of RtL who have expressed frustration at the mirroring when their muscle memory and mental model is familiar with the window/control layout. ...And particularly in the intermediate case of mixed-translation or partially-translated setups. Whoa, we haven't tested the mirroring at all! So it's not a Natty goal. Please drop from 3.6 goals. Hello Lavi. Mirroring, or the policy/logic code for when to activate is unlikely to "be ready for release". We have gone past feature freeze/UI feature feeze without it, which basically means that it's out of the window until the next cycle. 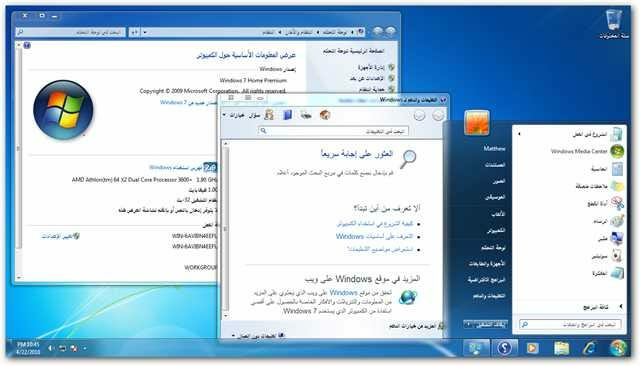 It's probably worth noting that some Arabic/Hebrew users have pointed out that they prefer *not* to have mirroring of the interface, so it's not a case of upsetting 100% of RtL users, but only the proportion of that percentage that would expect mirroring. as Lavi said it's a Bug not a feature . For me it's OK but I found more people complain about it . So please Mark and unity team consider this bug to be solved this cycle as possible . do i need the ppa? Lavi: to answer your specific query. The people who've mentioned preferring a non-mirrored RtL interface were not UI designers… although they were definitely technical users, and so those people more likely to be using a combination of RtL and LtR in their daily work. My memory is that is was the /unpredictability/ of the /mixed/ environment that was the root of the desire not to have an automatic straight mirroring of all interface elements. 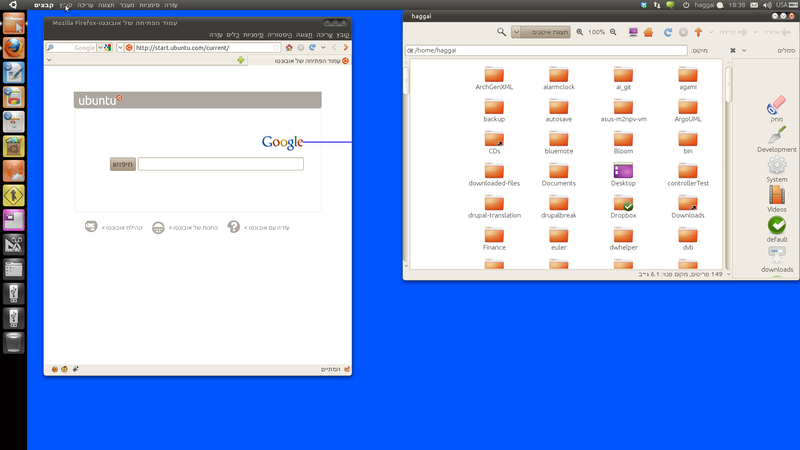 (This in no way downgrades the importance of having a working RtL mirroring setup available!). @Paul: I think I agree with Lavi, that most of the confusion is caused when many components of the desktop are mirrored, but Unity itself isn't. For users who choose to use an LtR desktop, they can always choose an LtR locale, and still use RtL languages without any problems, so I don't think there need to be any special support for them in Unity. I tried running the current unity-2d on Lucid, and see how LTR support is today. I think that almost nothing have changes since I've opened this bug, except perhaps the order of the app indicators and the direction where their menus open, which is fine. The app-indicators themselves are still aligned to the right, instead of to the left. The entire top panel should be mirrored. As for the rest of the desktop it remains the same as in the maverick version. The sidebar is on the left instead of on the right, the menubar is aligned to the left, and the menus themselves open to the right, instead of to the left. You can compare it in the screenshot to Firefox, which does it right. In the next attachment, I have a window maximized, and you can see how the window's close, minimize and maximize buttons are inconsistant between the windowed version and the top panel version. should we stick to 10.10 until that is fixed? that unity panel is moveable!Profit! think is a more difficult part. It's very disturbing for RTL users that Unity align to left. please fix it so urgently. Direct link to LtR-ish screenshot as provided by Nawfel above. Direct link to RtL mockup as provided by Nawfel above. We discussed that in #u-desktop. 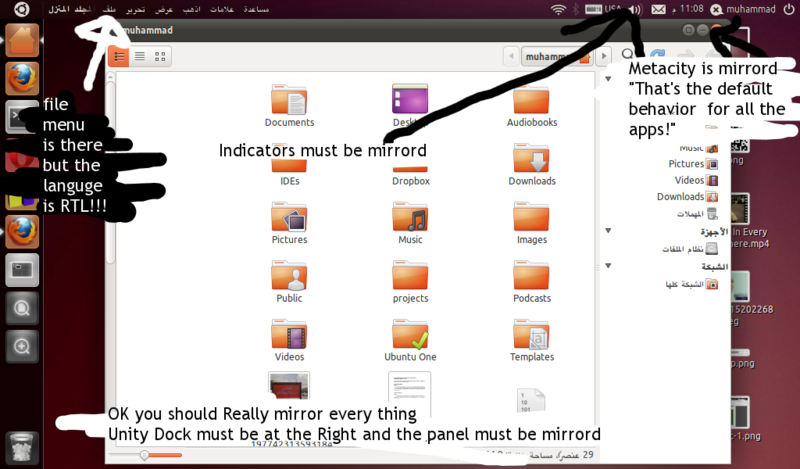 For Oneiric we should ship the feature in the distro, but disable it by default. Then we can send a call for testing and document how to turn it on, so that interested people can test/use it. For P we should turn it on early, and also get this fixed in 3D, so that the two are consistent. did anybody see this (attached), the letters are coming out of the box. David, I think you are talking about bug #834765. Unity 2-d still doesn't mirror panel or launcher for me although it says fix released for 2d. I have unity 4.12 and tested with arabic language. The right-to-left mirroring is only enabled when the translation of the QT_LAYOUT_DIR string in the current locale is "RTL". I understand from https://translations.launchpad.net/ubuntu/oneiric/+source/unity-2d/+pots/unity-2d/ar/10/+translate that it is not translated yet. Please note that until bug #836498 is fixed, turning on this feature can make the dash almost unusable. So - practically - this bug is far from fixed. Or am I wrong ? The bug Haggai mentioned above is fixed in trunk, but unfortunately won't be available in Oneiric. Haggai made a huge contribution https://code.launchpad.net/~haggai-eran/unity-2d/rtl-rebased/+merge/82151 which we're slowly going to integrate into Unity 2D and improve the RTL experience greatly. Thanks for the update. Any idea if this will be implented within Precise? > be available in Oneiric. > into Unity 2D and improve the RTL experience greatly. > RTL, which is subscribed to the bug report. > Unity doesn't mirror its interface for RTL locales. > right, and the top panel's items should be ordered from right to left. > the right instead of to the left. > The exception is only for Unity 2D for which the RTL support is ready. > languages is left entirely untouched. Please, if RTL in Unity/2D is not ready, make the users fall back to the known working shells. Actually, I must be corrected. 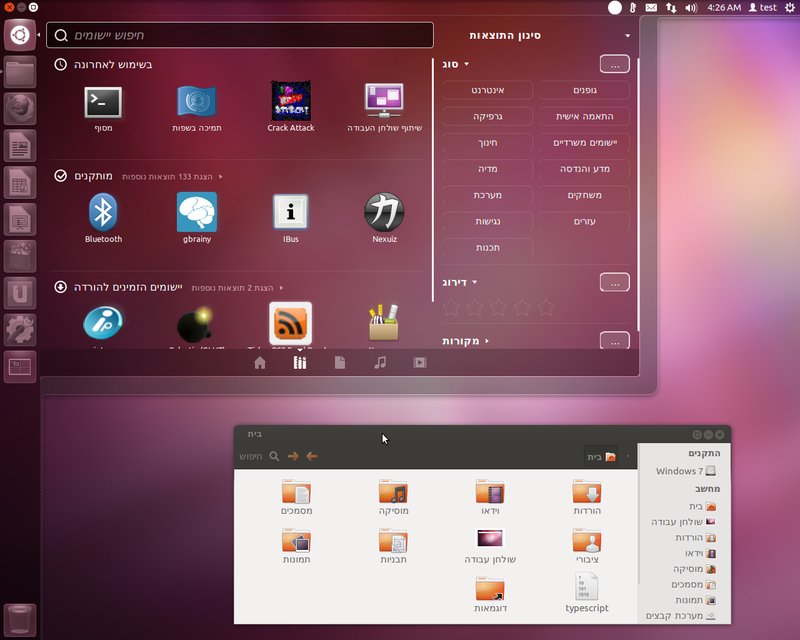 The only graphical shells in Ubuntu live images and default install are Unity and Unity 2D. Unity 2D does RTL mirroring quite OK in precise currently. Thank you Haggai Eran. And Unity proper doesn't do mirroring. So the preferred shell for RTL locales users would be Unity 2D until Unity is RTL'ed properly. > images and default install are Unity and Unity 2D. > And Unity proper doesn't do mirroring. > Unity is RTL'ed properly. 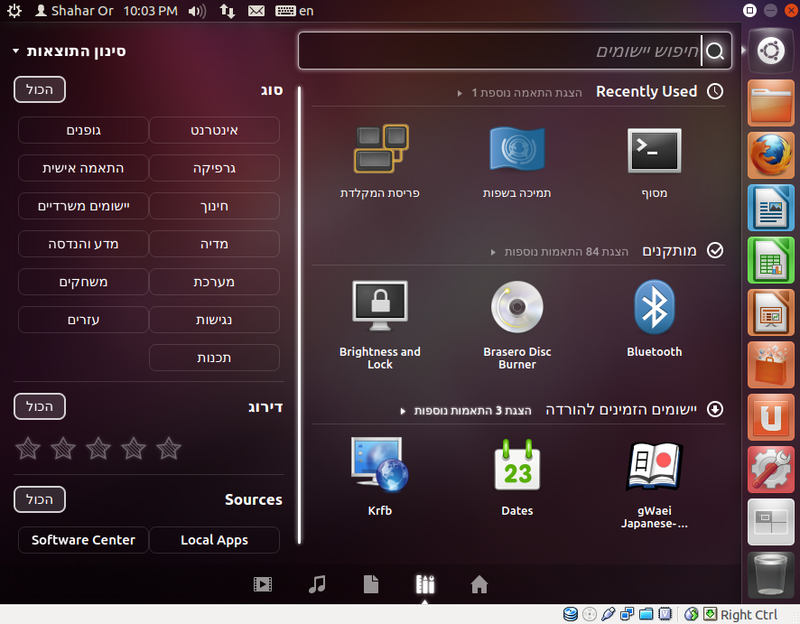 Here are screenshots from precise. 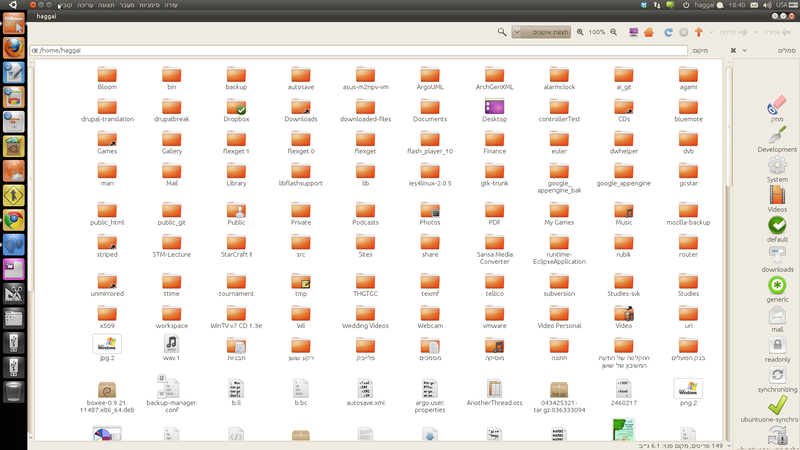 Let's talk about the call for help in the Ubuntu-RTL mailing list, ok? This is stunning. I agree, while we should also mail OMG Webupd8 Editors - that should do some media work. Lenses were translated properly, no untranslated strings should appear now. I have created a small patch that will cause Unity to fall back to Unity-2d when the current language is written from right-to-left. This could be used as a temporary workaround, until Unity gains better right-to-left support. The patch also allows overriding this behavior by setting an environment variable (UNITY_ALLOW_RTL). You can find the patch at lp:~haggai-eran/nux/rtl-fallback-to-unity-2d. Comments and responses are welcome. Thanks a lot for the patch. The DX team folks can give you better advice on this, but as the patch addresses a workaround rather than a fix, it'd probably be better to file a separate bug for it (e.g. "Fall back to Unity 2D for RTL locales"). Dear David, as per your suggestion, Bug #963682 was reported and Haggai, your branch was linked there. I don't see any progress since April, and the next release of Ubuntu is just a month by now. Will this bug be fixed in the coming release 13.10? Guess we are going to have another version with the same bug. > just a month by now. Will this bug be fixed in the coming release 13.10? Falling back to Unity-2D has not been an option since Unity-2D was dropped from Ubuntu. Yes, it's true that this bug will not be addressed for Saucy (13.10). Adding proper LtR support to the Unity 7 stack is a large risk that will require several weeks of full-time engineering work and it competes with many other bug for the available resources. I can only offer apologies and say "maybe next cycle." Arabic in the 5th place with somewhere between 255 to 422 million speakers. Urdu in the 13th place with 104 million speakers. speakers not including Arab Israelis that use Hebrew on a daily basis. The numbers are reaching from 400 to 640 million, do whatever you please. > Yes, it's true that this bug will not be addressed for Saucy (13.10). > and say "maybe next cycle." The patches in 12.04 were only for Unity-2D. The patches I had for Unity(-3D) were preliminary (libnux only), so they would have required some more work to be used with 12.04. I don't think they will apply to current versions of Unity without significant changes. However, once Unity(-3D) moves to using Qt, it would benefit from the already existing right-to-left languages support that Qt has, in the same way that Unity-2D did, and it should become easier to support right-to-left languages. OK, so in this case we'll just give up and wait for the Qt implementation? you know why? because it affect only the RTL users. where is your principle that ubuntu is available for anyone whenever his language. good job canonical, the most RTL users left the unity desktop and are now using differents desktop because of your ignorance. summary: - Unity doesn't mirror its interface for RTL locales. From what I read, unity 8 is moving to QML. Since Qt and QML bring full RTL, bidi, and UI mirroring support, I expect this bug to be (relatively) easily fixed there. Since Unity is dead this bug is no longer valid.